The Shady Dell Vintage Trailer Court in Bisbee, Ariz., has a fleet of a dozen restored travel trailers for guests. At the Shady Dell Vintage Trailer Court., a 22-foot-long 1955 Airstream is one of the vintage travel trailers, plus a bus and a yacht. This Airstream was the only model of its kind in what was then a fleet of 10 travel trailers, all dating from 1947 to 1959 and parked under trees and beside tiki statues at the resort in Bisbee, Ariz.
My overnight stay was the second of two visits to vintage travel trailer resorts. 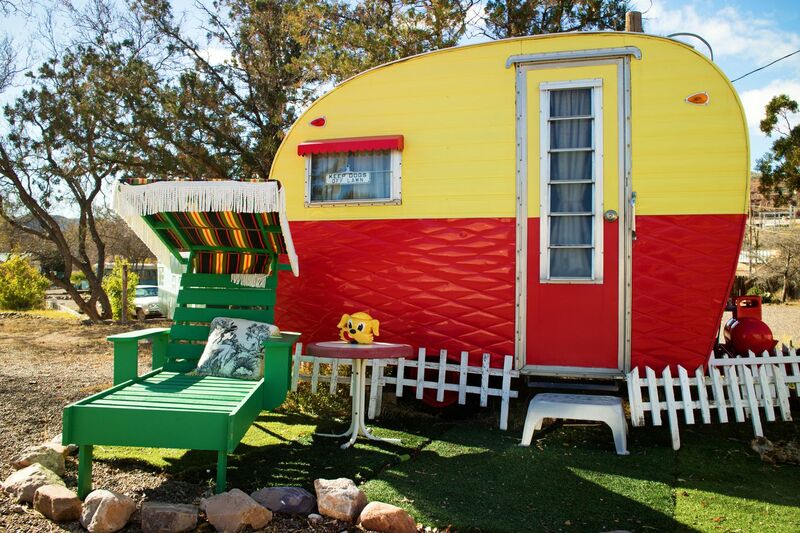 They cater to people who are captivated by quirky chic or midcentury design, who want to reminisce about bygone Americana, or who crave a nomadic lifestyle but don’t have the budget or space for their own RV. In a recent informal tally, I counted nearly 20 retro resorts in nine states from California to Tennessee, with more on the way. Some are rustic, with basic amenities, offbeat themes, and kitschy art. Higher-end retreats provide flat-panel TVs and luxury mattresses, linens, and toiletries. Many offer communal amenities: wine bars, pools, bathhouses, fire pits, and lawn games. My first stop was at the Sou'wester Historic Lodge and Vintage Travel Trailer Resort in coastal Seaview, Wash., a couple of hours northwest of Portland, Ore. The resort boasts 25 trailers, from a compact Shasta that sleeps one to the African Queen, a tri-level colossus that sleeps eight. The resort also offers cabins, lodge suites, campsites, and bring-your-own RV hookups across its three-acre grounds. In a 1950s Airstream trailer at the Sou'wester Historic Lodge and Vintage Travel Trailer Resort in Seaview, Wash., a dining table is situated on the other side of the kitchen, as seen from the sleeping area and bathroom. My husband, Andrew, and I stayed in a 1950s Airstream that reminded me of a metal cocoon. Our trailer packed two twin beds, a kitchen, dining table and chairs, half-bathroom, and personality into its 30-foot length. Vibrant orange ceiling, walls, and floor enveloped the living area, and flower-flecked curtains framed its windows. An original stove promised convenient meal preparation, and wooden cabinets provided more storage than we needed. It felt spacious and supremely livable. The Sou’wester resort makes deciding what to do spectacularly difficult. A tiny blue trailer named the Q-Tea houses an organic teahouse. Wellness activities include meditation, yoga, and lectures. Massage and quarterly art exhibitions are available in two trailers. There is a clothing-optional Finnish sauna. (We wore swimsuits, thank you very much, as did everyone else sitting shoulder to shoulder.) The beach is just over the dunes two blocks away. Guests can take classes including writing workshops, waltz, and embroidery. The Sou’wester has hosted more than 500 artists-in-residence through a nonprofit organization that administers its arts, music, and wellness programs. "We're more than a hotel," said Thandi Rosenbaum, who has owned the resort for seven years. "Our heart and soul is the quirkiness of the trailers and the other lodging, but our arts and wellness programs infuse life into what we're doing." Sou'wester's honor-system thrift store is housed in a creamy white 1960s Kenskill trailer with panoramic windows. On the lodge's wraparound porch, we browsed another store that offers local art, handmade goods, and groceries. At the Shady Dell Vintage Trailer Court in Bisbee, Ariz., a restored 1947 Airporter bus with a Polynesian palace theme sits next to its own outrigger bar. The Sou’wester is meeting growing demand by rolling out two new additions, a 1969 Silver Streak Continental and a 43-foot-long Bluebird bus with a cedar-clad sunken tub. More than a dozen additional trailers await makeovers and deployment. "At this point, we don't have to look for trailers. They find us," Rosenbaum said. "The restoration requires a master of all trades: mechanical, plumbing, electrical, woodwork, metalwork, and design." After that one night in the Airstream last spring, I was infected with enthusiasm for renovated trailers. In late December, I took a solo trip to Arizona’s Shady Dell, the country’s oldest travel trailer resort, which has been accommodating road-trippers since 1927. There, Hardy led me to my second Airstream, a 22-foot-long model. He pointed out its kitchen and new vintage-style refrigerator, then opened the door to a tiny nook that contained a toilet and sink. The Western-themed trailer was filled with character. A cactus cookie jar adorned the four-burner gas stove. Mexican blankets covered the two twin beds. Cowboy tchotchkes decorated the shelves. A red velvet couch and record player underscored the vintage flair. Crunching along a gravel path past the other trailers, I admired a bus parked next to its own tiki bar, and a permanently moored yacht, both built in 1947. I stepped onto the diner’s classic black-and-white tiles, and sat down on one of the 10 sparkly pink stools alongside a chrome-trimmed counter. The diner is available only for guests’ food preparation, but the Shady Dell plans to reopen it as a pop-up restaurant that showcases local and regional chefs. Five minutes down historic state Highway 80, I walked through Bisbee’s downtown, nestled in a valley in Southeast Arizona’s Mule Mountains, about 100 miles southwest of Tucson. Bisbee was once famous for mineral and copper mining; the Shady Dell sits across the highway from one of the old mines. I peered into window after window of art galleries, restaurants, and specialty shops, including a vegan general store. By the time I returned to my trailer, the temperature had dropped to below freezing. I turned on a portable heater that warmed the space before I finished cooking dinner, then tucked myself into bed with a pile of blankets. The next morning, I visited the Shady Dell's two newest acquisitions: a mammoth, 45-foot-long 1955 Kropf and a curvy, red 1950 Alma. Both awaited restoration. When I spoke with the Shady Dell’s owner, Justin Luria, a few weeks later, the rejuvenated trailers were available for overnight stays. "We restore castoff trailers and keep them going instead of letting them go into the dump," Luria said. "And we preserve a piece of American highway history that might otherwise be lost." Shady Dell Vintage Trailer Court, Bisbee, Ariz. Information: 520-432-3567 or theshadydell.com. Sou’wester Historic Lodge and Vintage Travel Trailer Resort, Seaview, Wash. Information: 360-642-2542 or souwesterlodge.com.